Caroline Hostetler arrived in Oklahoma determined to forge a new life for herself and her daughter, Emma. As a single mother, she values the warmth and safety she's found in close-knit Wells Landing. She's even caught the eye of a handsome newcomer--a man who just may be the partner she longs for and the father Emma deserves. But the arrival of an Englisher threatens to lay bare the secrets she's worked so hard to leave behind. . .
After losing his life-long sweetheart, Andrew Fitch moved to Wells Landing to work in his uncle's furniture business and nurse his broken heart. Finding love again seems all but impossible--until he meets Caroline and Emma. 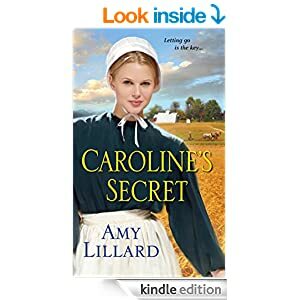 But his plans to join their lives together may be shattered when the truth of Caroline's past comes to light--unless, together, they can learn the true meaning of sacrifice and forgiveness. . The suspense of Caroline's Secret kept me turning pages wanting to know more. As I kept reading I actually became a little worried about how her secret would be found out. As we all know secrets usually do eventually come out. Caroline is in the forefront with her secret and budding romance but Uncle Abe was my favorite with his eccentric ways. His character brought a lightness and at times a sense of calm to this story. I continue to enjoy Amy Lillard's books. Her descriptions of Amish life, settlements, and traditions along with her wonderful characters are joy to read. With Caroline's Secret I felt as though I could pick this town out in Oklahoma with it's wonderful main street and beautiful countryside without a problem. Forgiveness and love are the key life lessons in this book and joy is not far behind. This book can be read alone with out any problem but the next book in the series is Courting Emily. I actually read Courting Emily first without a problem.